The Pendant is 1" diameter in Aluminium which is Anti Tarnish & hypo allergenic. Only short quotes or sayings will fit on this, Please message me if it is any longer than the quotes pictured & I can let you know if it will fir or not. Ensure you enter the text EXACTLY as you want it stamped, including spaces, comma, dot, heart, &. Please be sure to double check your spelling. For example: (heart) Name & Name (dot). Your welcome to message me if your worried about all the names fitting! Aluminium is hypo allergenic, it does not rust, change colour or tarnish. There is 7 different fonts to choose from, examples are in the attached photo's, if you like to choose one, just let me know at check out, otherwise I'll use the font in the main photo. 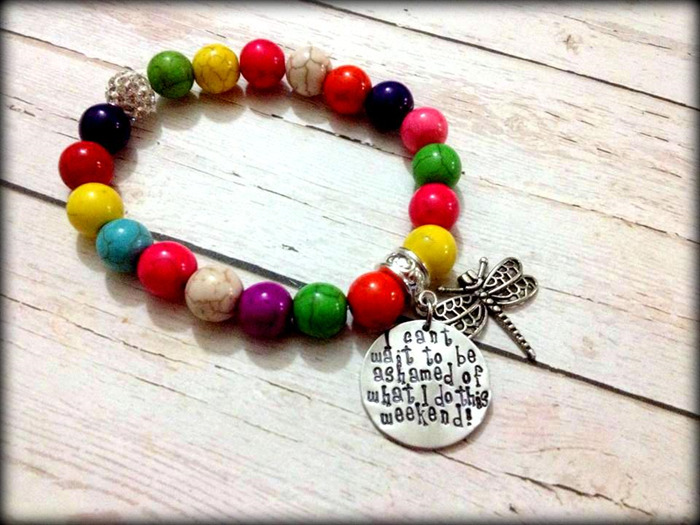 Hand Stamped, Custom designed, Personalised Jewellery, Specially made for you. I create simple, unique, and sentimental jewellery --- custom hand stamped necklaces, bracelets and other keepsakes, that can be personalised with any names, dates or words of inspiration. Choose one of our designs, or create your own! Each piece is custom made, designed & hand stamped by me. Love, time & attention to detail goes into each piece. Made with Love :)!!! As our jewellery is hand made it is important to understand that no two pieces will ever be the same. Sometimes letters don't line up perfectly or completely straight. This should be considered part of its personal character, rather than a defect! During the handmade process each letter is stamped onto the item one letter at a time using a brass hammer, our items are not machine engraved. The stamping process can leave slight marks to the underside of the pendant.